Lauren is an educator with a passion for increasing environmentalism by helping people develop a connection with the natural world. She received her BA at Marietta College with an art major and a double minor in biology and environmental science, focusing on recycled and found object art, nature photography, and the relationship between humans and the environment. She was one of the founding members of the recycling program on campus and may have raised a few species of mammals, insects, and spiders in her dorm room. Lauren received her Master of Education in Slippery Rock University’s Parks and Recreation/Environmental Education program. As an intern at the Moraine Preservation Fund she worked as an educator and mate aboard the Nautical Nature, offering educational tours of Lake Arthur to the public and environmental science classes to school children. She also taught osprey and owl programs and created an educational bat program to highlight the park’s Project Bat-itat. As an intern for Jennings Environmental Education Center, Lauren worked to integrate environmental education programs into the state required school curriculum with the goal of illustrating the importance of environmental ed in public schools. 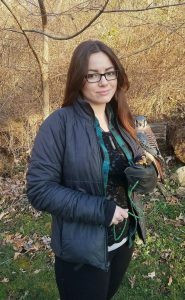 Shortly after moving to Morgantown, Lauren began volunteering with the Avian Conservation Center of Appalachia, where she feeds and cares for birds in the rehabilitation and education programs. Lauren had the opportunity to be a trainer for one of the current education birds and volunteers as a teacher for raptor programs.